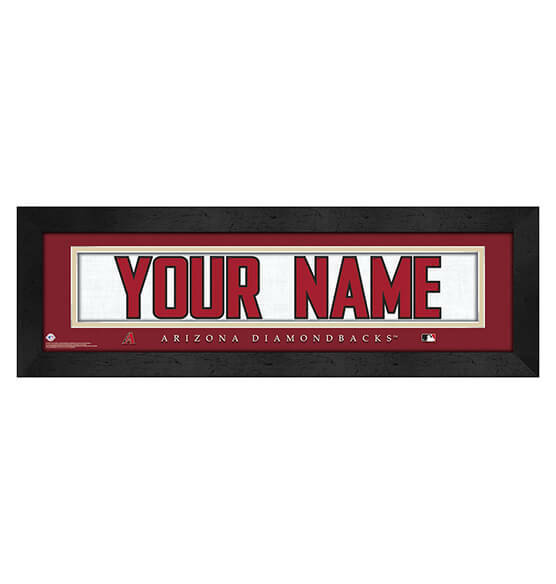 Whether you have a special D-Backs fan on your roster — or you are a fan yourself — this Arizona Diamondbacks Personalized Nameplate Framed Wall Art Sports decor is one fan zone piece no one should be without! Just let us know what name you want on this baseball decor print in D-Backs team colors, up to 12 characters, and we'll take care of the rest. Designed to look like a Diamondbacks team jersey, this striking glass and black-framed art piece arrives ready to hang thanks to a sawtooth hanger on its back. Take our word for it: this gift is guaranteed to be a dinger!